The Scottish Parliament has had its high points and its low points but the past couple of days has witnessed as woeful a low as I can remember. Scotland’s mainstream political parties appear to value petty point-scoring about who said what when rather than get to grips with the issues at hand. 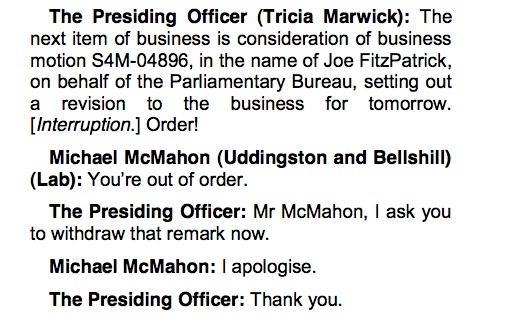 Yesterday, Michael McMahon lobbed an insult at the Presiding Officer leading to his suspension from Parliament today (see extract above). Today, First Ministers’ Questions had more in common with a school playground than a Parliament. It was a lamentable and infantile occasion wiht a lot of shouting and arguing about numbers. And, as if to underline the extent to which Scotland’s main political parties have become infantilised, they each produced their own press releases accusing each of other of lying and misleading Parliament. It is not simply the childish behaviour on display. A particular low point for me was something upon which probably no-one took issue. In answer to Johann Lamont’s opening question at First Minister’s Questions today, Alex Salmond responded by beginning with a warning about the impact the weather was having on Scotland. Now the weather is important but the fact that the First Minister chose to make these remarks illustrates the extent to which the Parliament and the Scottish Government have co-opted virtually every issue as a national issue. Planning for, and responding to, extreme weather events is primarily a responsibility of Scotland’s local authorities and emergency services. The Scottish Government and its agencies have a role to play in providing support and backup. It may not be a very good example but it follows on from questions to the First Minister such as whether some patients in a hospital had blankets or not. In short, government in Scotland has been hollowed out and responses, accountability and questions which should be directed at local government are now seen as legitimate causes for political debate at Holyrood. 137. The manner in which Parliament debates some essentially local issues can work to constrain local government. In England, local government’s alleged failings quickly get elevated to the level of national debate on the floor of the House, as recently seen with regard to child protection issues—the Baby P case—and preparation for heavy snowfall. The effect of repeated parliamentary interventions is to encourage the public and media to look to central government to solve local problems, and to prompt central government to act. To help achieve the benefits described by Professor Tony Travers, Parliament may need to curb some of its own interventionist instincts. We were told by local politicians during our trip to Denmark and Sweden that, having agreed the overall framework and guidelines, each country’s Parliament kept out of local government affairs. Whilst we fully accept that MPs have an obligation to raise issues that matter in their constituency, it may be that they need to set themselves a higher threshold before raising and debating essentially local matters in the Chamber of the House. Earlier today, I watched the City of Edinburgh Council meeting which is now webcast. It had its heated moments but on the whole the debate was informative, measured and reasoned. I really don’t know how the Parliament has sunk so low. I guess the purpose of this blog is simply to note the fact that it has and to highlight once again the fact that governance in Scotland remains a weakened and shallow affair. Nothing new in this! The parliaments of both the UK and Scotland have been more akin to a playgroup rammy than a serious debating area for as long as I can remember. Political point scoring and personal also (remember – parliamentary privilege), means that nothing is really ever debated to such an extent that meaningful solutions are forthcoming – see the Offensive Behaviour at Football, etc Act 2012 for an example of the evidence of that. The appalling standard of politicians leads inevitably to sterile and often puerile parliamentary debates. I suggest that many of those masquerading as democratic representatives have little or no idea where their responsibilities begin or end. I would argue that the party political system leads to the effective disbarment of any person (with pitifully few exceptions) that would actually have the moral and intellectual capacities desirable to fulfil the role of an elected representative. This state of affairs is certainly not restricted to Scotland and if allowed to continue will have (further) catastrophic consequences. We need a new political paradigm and we need it yesterday! It appears that there is a tactic by the ‘Bitter Together’ parties to create further disengagement of the people of Scotland in the body politic by throwing outragious allegations around as if they were confetti at a wedding. The PO can only referee the chamber, if one side are content to kick lumps out of the other side regardless of the consequences and then attack her for bringing them to task, only cynicism wins! But that appears to be the aim, sad really.